Ply-wooden case and weight 60KG/Set. in 20 days after receiving the deposit payment. 1. In not stable rock formation, the casing is necessary to follow. 2. Usually in water well drilling, for large hole boring. 3. drilling depth is better less than 40 metres to control the hole well. 4. match to 12" hammer and 325mm casing tube. 5. air pressure is 20 Bar and air volumn is 500 cfm. 6. the tools is fetched out to use in the next holes. 1. the eccentric design is very flexible to drill holes less than 219mm. 2. easy to follow the casing. 5. reverse rotation and withdraw the whole set to use them for next holes. The company is responsible for any problem caused by defaulty of material and maching. The broken parts will be replaced at the sight of photos and product serial code. 30% at the order and full payment at the sight of shipping advice. in 25 days after receiving the deposit payment. 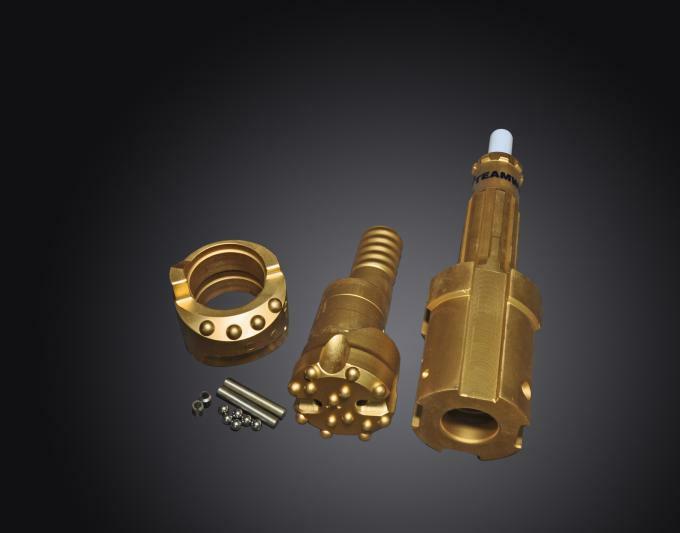 China Good Quality DTH Drilling Tools Supplier. Copyright © 2018 dth-drillingtools.com. All Rights Reserved.